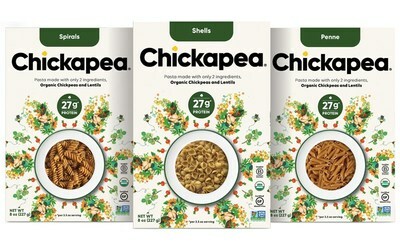 COLLINGWOOD, ON, March 4, 2019 /CNW/ - Chickapea, one of the world's fastest growing organic pulse-based pastas, is proud to announce that they have officially received Women's Business Enterprise (WBE) Certification. The WBE Certification was issued after an assessment had been conducted by WEConnect International and it was verified that Chickapea is at least 51 percent owned, controlled, operated, and managed by a woman or women. "We are thrilled to be one of the latest recipients of WBE Certification and helping push a larger dialogue in the business world. Since our inception, we've been a proud women-owned business and have maintained a workforce that is predominantly female," said Chickapea Founder and CEO Shelby Taylor. "With International Women's Day just around the corner, it is paramount for us to increase the presence of and opportunities for female entrepreneurs, and to continue making strides in areas such as closing the wage gap and ensuring women have the same opportunities as their male counterparts." Advantages that come with WBE certification include access to procurement executives at hundreds of major corporations and government entities, opportunities to connect and pursue business deals with other members, the use of the certified WBE seal on marketing materials and representation of women business issues in key forums. The WBE certification joins several others that Chickapea already boasts including organic, B Corp, non-GMO, kosher and gluten-free. Zenabis Global Inc. has completed the acquisition of 51% of Hillsboro Corp Inc., a Canadian cultured tea beverage company known for its True Buch Kombucha. Zenabis and True Buch intend to utilize each other's expertise to infuse cannabis into True Buch beverages, creating a cultured tea beverage CBD product. True Buch is a kombucha company with expertise in the creation of cultured tea beverages, that are raw, unpasteurized, gluten-free and non-GMO. This acquisition is ahead of edible legalization in Canada, which is expected to occur in late 2019. Zenabis is excited to be entering the cannabis-infused beverage market, which is forecasted to be a $600 million-dollar industry in the next four years (Business Insider, Oct 1, 2018). Even prior to cannabis legalization, Kombucha has been a natural and healthy alternative to sugary drinks for Canadians. Kombucha sales in Canada have grown exponentially, reaching $1.4 billion in 2016, and forecasting to reach $1.6 billion by 2021 (Euromonitor International, May 28, 2018).